Conversion Rate Optimization (CRO) is a hot topic right now, and for good reason. While conventional thinking was always to drive more traffic to a website if the goal was to increase conversions, today’s savvy marketers and website owners are finding that optimizing a website for the traffic that’s already there is often a better choice. Turns out, a smart mix of paid traffic, organic inbound, and CRO often yields the best results. While paid and inbound marketing are fairly straightforward, established strategies, there are many moving parts to a successful CRO campaign. It’s not enough to make changes to your website for the sake of making changes, because your competitor is doing it, or because you have a “feeling” that something would work better. There is an art and science behind increasing conversions; when done right, CRO goes beyond boosting conversions to having a direct impact on your bottom line. The right changes to a website have helped some businesses increase conversions by more than 500%. While these are some pretty extraordinary examples, imagine increasing your conversions by as much as 25%. For example, if you’re an ecommerce site that wants to increase the number of shoppers that take advantage of an offer for an add-on item that costs $10, and you have 10,000 transactions each month, a 25% increase in conversions on those add-on items could translate to an additional $25,000 in sales. And it could possibly be accomplished by something as simple as making the call to action button more visible. This comprehensive guide will cover the basics of CRO, how to conduct a CRO audit, how to identify and measure your business’s conversions, some specific strategies to consider based on your goals, and how to use offers as a CRO strategy for a fast, guaranteed boost. Part 1 – What Exactly Is CRO? Simply put, Conversion Rate Optimization leverages traffic already on your website, to convert more visitors into buyers and subscribers. It’s about working smarter, not harder. Instead of driving new traffic to your website, you’re optimizing your website to capture existing visitors and entice them to take some specific action. Leverages existing traffic – at the heart of CRO, its biggest advantage is that it leverages traffic that is already on your site. Getting traffic to your site is hard enough; watching those visitors come and go without doing anything is frustrating – and costly. CRO is about getting the visitors who are already there to convert. Saves you money – unless your website needs a complete overhaul, making minor changes for CRO is often far more affordable than SEO, paid ads, and inbound marketing strategies. As your conversions increase, your acquisition costs decrease (see below), and over time you can even reduce your budget on new traffic until you find your sweet spot. Lowers your customer acquisition cost – here’s a quick example: if your set ad spend is $1,000 and you drive 10,000 visitors to your site monthly, increasing your conversion rate from 10% to 15% will lower your CAC from $1 to $.66. Increase conversions to 25% and your CAC becomes just $.40. Drives revenue – whether your goal is to increase ecommerce sales, or increase conversions that drive leads through your sales funnel, every additional conversion ultimately impacts revenue at some point. Newsletter signups help you engage and nurture prospects until they eventually become customers, while using offers to entice shoppers can instantly boost sales. Helps you better understand your customer journey – you may have a vision for your sales funnel, but a CRO audit and testing may reveal that customers have a different way of interacting with your website. They may want to see pricing before scheduling a demo, or they may need to read several articles before subscribing to your mailing list. Grows your mailing lists – if you use any form of email marketing, then getting people to opt-in or subscribe is a top priority. Optimizing the placement, timing and appearance of sign-up forms on your site can significantly boost your conversions and grow your lists. Increases the profitability of your website – When you increase conversions, subscribers and buyers, the ROI of your CRO strategy increases as well. Investing in your website in the short-term to improve user experience and grow conversions, makes your website more profitable in the long run. What Does A Conversion Look Like For YOUR Business? Every business will have a different definition of what a conversion means to them, and often conversion goals will even be different from page to page. While ecommerce sites might be focused on the end game of simply making more sales, a B2B software company has to focus on nurturing prospects through several touches before they become a paying customer. Each point in the funnel has a conversion element to it; the prospect is taking some desired action on the website to get closer to becoming a customer. Your specific conversions will be based on what is needed to achieve your business objectives. While the end goal may simply be to increase sales or grow your business, the path from prospect to customer is different for every business and your conversion goals should reflect that. Once you determine where you want to increase conversions, it’s time to start thinking about specific CRO strategies that can be used to get you there. Like determining conversions, selecting CRO strategies is very business-specific. What works for one website is not necessarily going to work for another website. This is where a CRO audit comes into play, as it will help you identify areas on your website that can be improved to increase conversions, and what specific strategies can be used. So now you understand what a conversion is, why they’re important, and how to conduct a CRO audit for your website. Now the question becomes, how do you actually get people to convert? What are these CRO strategies we keep talking about? Some of these we’ve already touched on in this article, but here’s a more complete list. Optimize Landing Pages – The number one goal of a landing page is to convert. Take this 7 minute quiz to see how yours stacks up, then use A/B split testing to make changes and pit two versions against one another. Tweak Calls to Action – If your CTA is always at the end of the page, experiment with moving it up or creating multiple CTAs on a page. Update the wording, make it a button, change the color. You would be amazed at the results businesses have seen with just minor changes to their CTA. Make Forms Frictionless – Remember, length does matter, but also so does what you’re asking and the value you’re offering in return. Placement, design, and timing of the form on the page also affect a person’s willingness to complete a form. Offer Real-Time Scheduling – Instead of having visitors submit a form to request a callback, allow them to schedule their own appointment in real-time. For example, on Picreel’s Money-Back Guarantee page, we allow prospects to automatically pick a time and schedule a free 15-minute call with a CRO expert to talk about their conversion goals. Add Chat Functionality – When visitors can get answers to their questions instantly, they are more likely to continue interacting with your website. As a bonus, chat reps can send links and steer prospects toward the next action they need to take to convert. Improve Checkout Process – We talked about this briefly, but friction in the checkout process is a silent sales killer. In fact, checkout usability studies by Baymard found that the average ecommerce site can increase conversions by 35.26% strictly through better checkout design. Use Automation & Retargeting to Capture Lost Traffic – Retargeting technology allows you to follow lost traffic around the web and show them relevant ads; if you did capture an email address, you can use your email automation system to send an email reminding the visitor that they left an item in their cart, or offering them a discount to return and complete their transaction. Using Offers for CRO – Today’s popup offers integrate seamlessly with your website and offer very granular targeting to show the right offer, to the right visitor, at the right time, for maximum conversions (more on this in a minute!). Ensure Offers are Valuable – Whether in an overlay, on a landing page, or a form, anything you’re offering visitors – discount, download, demo, etc. – needs to be relevant and valuable. Want even more quick-hit tips you can implement right now? Check out these 21 CRO best practices. You can read more about CRO strategies here. This article was written for agencies that offer CRO as a service to their customers. It is an in-depth look at CRO that delves into the process of evaluating content and the effect that personalization has on marketing after the conversion. Specifically, how the targeting of overlays can be used to capture data about what a person was doing on your website, and what types of follow-up emails and content you should send them. When you’re just getting started with CRO, it’s easy to get overwhelmed with the amount of information available to you.You’ll read case studies about businesses that have increased their conversions hundred of times over, and you may be tempted to mimic what they’re doing. But at the end of the day, that’s going to be a waste of time and money. Your CRO strategy will be specific to your business, your audience, your website, and your goals. Most importantly, your CRO strategies should be selected based on data, not instinct. This is why it’s sometimes easier to have an outside firm conduct the audit. They will not only have the tools and knowledge to gather relevant qualitative and quantitative data, but they will also be able to conduct an unbiased audit and provide recommendations based on hard data. 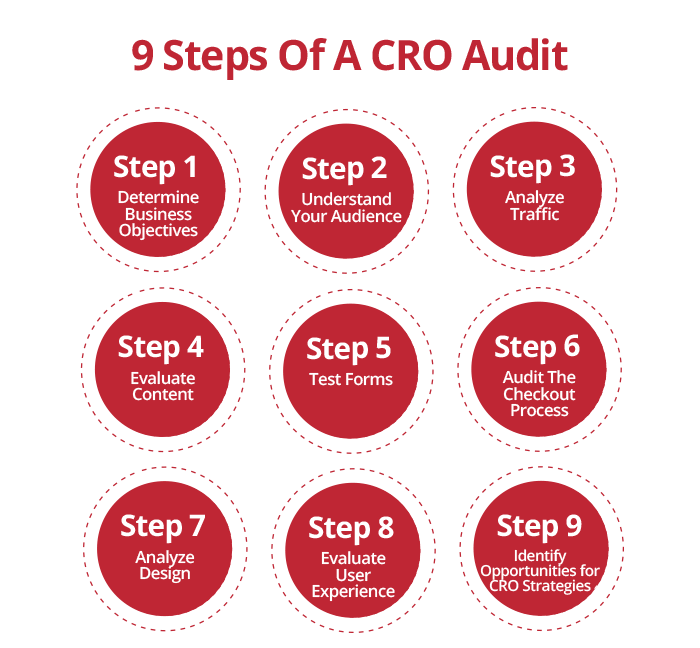 Let’s take a quick look at the nine steps involved in a CRO audit. You can also read our comprehensive guide to CRO audits here. This guide is specific to agencies that offer CRO as a service to their customers, so it is an in-depth, step-by-step look at what is involved in a conversion audit. 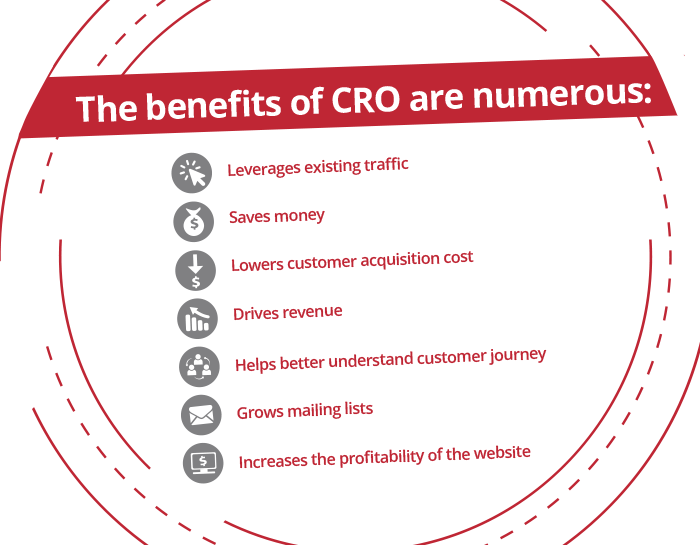 The first step on any CRO journey is determining your business objectives. Look beyond the actual conversion (action), to see how that action supports your business’s goals. Why do you want to increase newsletter signups? To increase awareness of your brand? Send special offers and pricing? What do you hope to accomplish? Do you hope that by increasing awareness more people will click through to your website to read a blog, download a guide, or contact you? By sending special offers, do you hope people will go to your website and make a purchase? Getting more names on your mailing list is a noble goal, but it’s more important to have a plan for putting those names to work to support your business objectives. Knowing your audience is critical for developing a successful CRO strategy. Everything from wording content, to designing your website, and creating compelling offers, hinges on how your audience perceives your business and engages with your website. While you can analyze visitor behavior by using your website’s built-in analytics or Google Analytics, as well as heatmaps and session recordings to track activity, collecting feedback directly from prospective customers – also called qualitative data – is often the best way to quickly understand your audience and their needs. How do you collect qualitative data? Just ask! Using an offer overlay, like Picreel’s ReelSurvey allows you to create popup surveys to collect on-the-spot feedback from your website visitors. Just keep in mind, timing is key. While a survey that displays the moment a visitor lands on your website may be considered annoying, one that is timed after the visitor has had time to explore will get a far better reception. You can also use your mailing lists and social media to extend survey invitations to collect qualitative data. Knowing where your traffic comes from – paid ads, search engines, social media, or referring websites – helps you better understand your audience and create content that speaks to them. If you use Google Analytics you can place tracking codes in your content that is published anywhere off your website – paid ads, social posts, guests blogs, etc. – which will allow you to track where the traffic is coming in from. The next logical step is to create custom landing pages so that when someone clicks through from the ad, social post, or guest blog, the content completes the narrative by answering questions, solving a problem, and offering a strong call to action. For example, if your product was featured by a prominent industry blogger, you can create a landing page with an exclusive offer for the blogger’s readers if they buy now. The other consideration here is the landing page itself (more on this in step 4). If you have a healthy amount of traffic coming in, but your landing pages are not converting, you need to take a look at the content, design and relevance of offer. You’ve heard the saying “content is king,” and it really is true when it comes to optimizing your website for conversions. People are smart. They recognize when a business’s message is helpful, and they understand when it’s a shameless sales ploy. They can tell the difference between valuable content that is well research and unbiased, and meaningless words meant to fill a space. You want your content to always be the former. If you are having a hard time looking at content objectively, this is another good place for a CRO firm to step in. Your underperforming landing pages are a great place to start testing, as they have very specific conversion goals, and often contain certain standard elements, such as image, content, call to action, and form. After finding problem areas, you can choose to make one change at a time and analyze performance; or, you can split test two different landing page versions at the same time. Google Analytics has a built-in Optimize feature that allows you to split test pages, and Optimizely is another popular platform with robust experimentation tools to help you quickly pinpoint the most effective elements of your content. Read more about what to do if your content is not converting here. Forms are a hot topic when it comes to web design. While form length is important, you should carefully weigh how much information you really need to collect against a visitor’s resistance to complete a longer form. In other words, is your goal to simply collect as many leads as possible, or are fewer, albeit higher-quality leads more important to you? In addition to length, what other factors determine whether or not visitors complete your forms? The type of information you ask for, the value of the offer in exchange for their information, and your brand/website’s credibility. Once you determine the goal of your form, you can split test two different versions to see which performs better. In addition to the form’s length and content, don’t forget to experiment with form design, placement and timing on the page. If you’re an ecommerce site, you know the very real challenge of shopping cart abandonment. In fact, nearly 70% of online shoppers add items to their cart then never complete the checkout process. While this is frustrating for retailers, it’s the reality of the online shopping environment. People browse products on multiple sites, adding items to their carts to save them, even though they are not ready to purchase yet. It’s window shopping on the internet. But sometimes friction in the checkout process, not shopper’s readiness to buy, is the real issue. While your website analytics can be helpful in showing you how far through the checkout process shoppers make it before abandoning their cart, session recording, can be a more valuable tool in seeing precisely where the hangups are occurring. 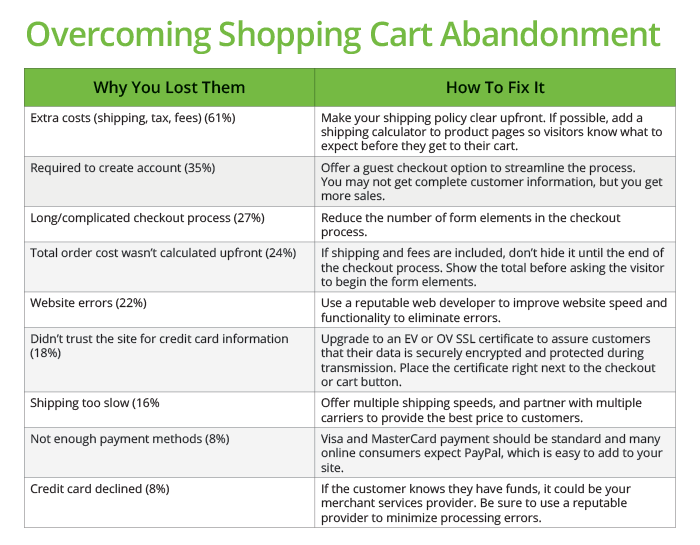 Here are the top reasons shopper abandon their carts, and some quick tips for fixing it. Read more about shopping cart abandonment here, and how to use overlay offers to overcome it and turn more visitors into buyers! How a website looks is another important factor when it comes to conversions. In fact, it takes less than two-tenths of a second to form a first impression of your website. You might have all the right elements in place, but if the font is difficult to read or the colors too jarring to look at, a visitor may navigate away before seeing what you have to offer. White space – White space breaks up copy and website elements for a cleaner look that is easier on the eyes. Color – Colors evoke emotion and help with brand recognition. Images – Relevant images give context to your content, break up text, and make a site more visually appealing. Navigation – Users should be able to easily find what they’re looking for through menus, search bars, and other navigational tools. Calls to Action – Where you place your CTA buttons, the size, text, and color all affect conversions. 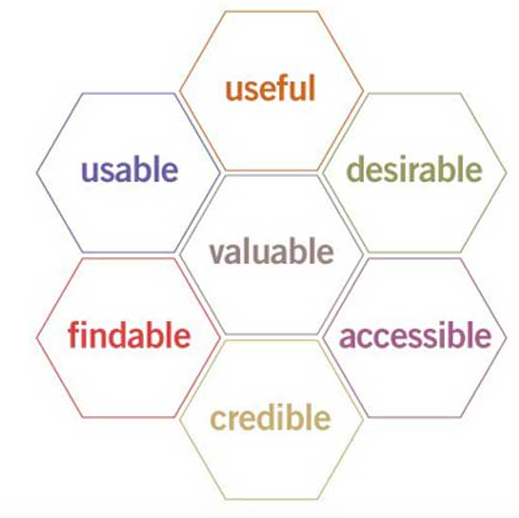 When conducting a UX audit, you should test your website against each element in the UX honeycomb. This is another area where it can be particularly helpful to have a third-party CRO firm conduct the audit to ensure it’s objective and data-driven. Through every step of your CRO audit, you will find areas for improvement and places where CRO strategies can be implemented to increase conversions. This is where you’ll finally start to lay out what strategies you want to test! Before making any changes though, it’s important to develop a specific hypothesis about each problem, a proposed solution (CRO strategy), the desired outcomes, and set a goal so that you can measure the efficacy of each strategy. Goal: Increase conversions by 10%. You’re ready to officially get started with CRO. Great! But if you’re doing it the right way by conducting an audit, creating strategies based on data and research, and developing measurable goals you can track, you’re probably thinking, “This is going to take some time.” And you’re right. Like its cousin SEO, CRO is not an quick fix. It takes time, and there are a lot of moving parts to manage and track. With Picreel’s conversion rate optimization platform, you can get started creating offers and launch your first offer campaign within minutes. Our user-friendly, intuitive platform offers more than 40 built-in templates with sample colors and wording that you can customize within minutes with zero coding experience. Most importantly, using offers as a CRO strategy works for any business in any industry. A local handyman can use offers to increase his customer base by offering new visitors a special discount, and an enterprise software company can use offers just as effectively to grow their mailing list or schedule demos. What else does Picreel offer? Getting started with Picreel is simple, but there are a few best practices to keep in mind in order to create successful, high-converting offers. Value – If you’re asking for a visitor’s email address (which means you’re also asking for their permission to send them ongoing emails) in exchange for something, make sure that “something” is good. It goes back to the “what’s in it for me?” question that is always in the back of your visitors’ mind. Your offer should make completing the transaction a no-brainer or downloading the ebook a must-have — something of true value to visitors. Relevancy – In line with your offers being valuable, they should also be relevant to what the visitor is doing on your site at the time the offer is shown. For example, if a shopper puts a pair of boots in their cart, don’t ask them to subscribe to your mailing list. A more relevant offer would be to show them a product suggestion for a complementary pair of sock, or offer them a shipping discount to entice them to complete the transaction. Targeting – Showing the right offer, to the right person, at the right time, is at the heart of creating a stellar offer campaign. Picreel offers advanced targeting options to allow you to display offers on exit, after scrolling a certain percentage, after being on a page for a set amount of time, and even based on the referring website, whether they’re a new or returning visitor, and whether they met specified cookie parameters on your site. 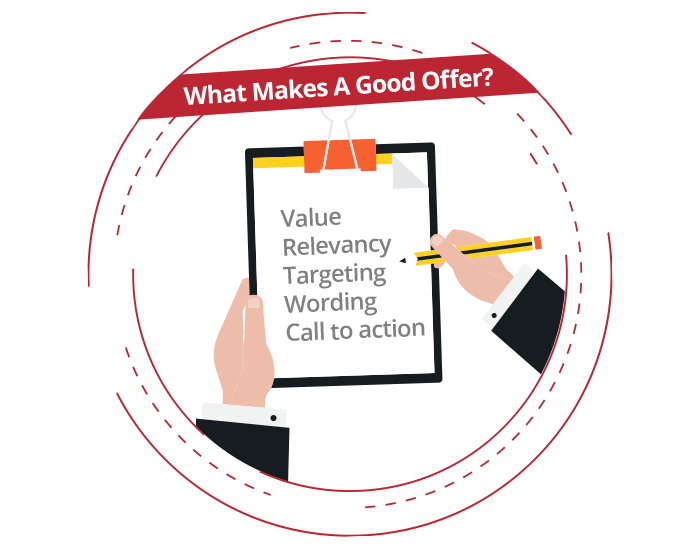 Wording – How you phrase your offers can make or break the conversion. The goal is to keep it simple and succinct, use actionable language, make the value abundantly clear, and always invest in high-quality copywriting to avoid embarrassing errors. Call To Action – With overlay offers, you have one shot at converting a visitor. Make it count. Tell them what you want. What they get. How to do it. And make the reward instantaneous. Read more about what goes into a great offer call to action here. Seems simple enough, right? If you want more, check out our in-depth guide to getting started with offers for CRO. We walk through setting up an offer campaign in Picreel step-by-step, including screenshots from the back end of the software and inline tips for making the most of your offers. Ready To Get Started With Picreel? The beauty of using offers as a CRO strategy is that it’s something you can start right now while you’re working on other strategies in the background. Content isn’t always easy or simple to fix, nor is overhauling a landing page. But Picreel is something you can have up and running in minutes. Curious about what Picreel could do for you? Check out our free Conversion Rate Calculator. Input a few simple numbers and instantly see how using offers as a CRO strategy could boost your conversions. Get started with your FREE 30-day trial now, or contact us at 888-891-5782 to speak to a CRO expert about your conversion goals.